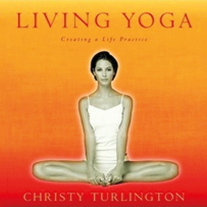 Christy Turlington is a serious yoga practitioner who has been practicing for over 15 years. In this book she explores the eight tenets of yoga and discusses how to incorporate it into everyday life, no matter how busy you are. She also touches on how yoga has made her own life more peaceful through stressful times and events. Both revealing and instructional, beautiful and covetable, Living Yoga is suitable for people of all levels, from those who are trying yoga for the first time to more advanced practitioners. Model, entrepreneur and advocate of yoga, Christy Turlington is a serious yoga practitioner. She is Editor-at-Large for Yoga Journal and has a BA in Philosophy and Comparative Religion from New York University. She heads two companies – Nuala a yoga lifestyle clothing range and Sundari, a line of skin-care products based on the principles of ayurveda.